Pell Grants For Prisoners: An Old Argument Revisited : NPR Ed The Obama administration is expected to announce a new program Friday that would once again allow some prisoners access to federal college funding. 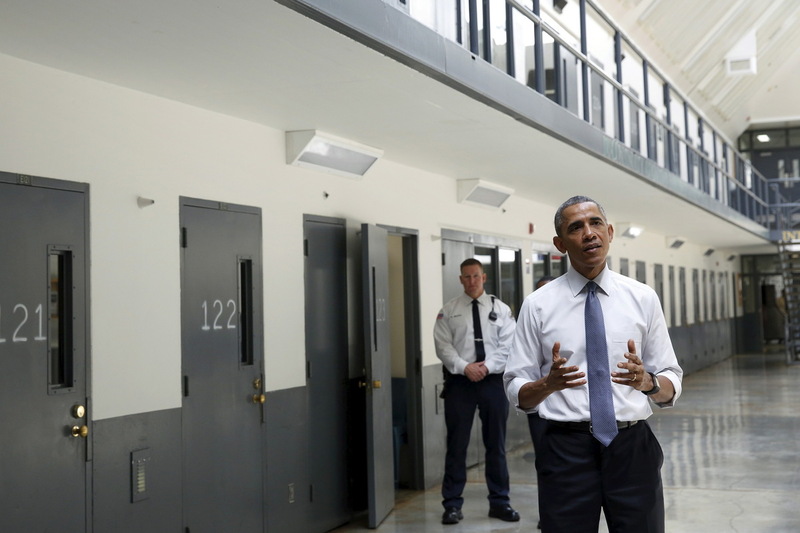 President Obama is the first sitting president to visit a federal prison. It's an old and controversial question: Should federal Pell grants be used to help prisoners pay for college? Tomorrow, at a prison in Jessup, Md., Education Secretary Arne Duncan and Attorney General Loretta Lynch are expected to unveil a program to do just that. The new plan would create a limited pilot program allowing some students in prison to use Pell grants to pay for college classes. The key word there is "limited" — because there's only so much the administration can do. To understand why, we have to go back to November 1993. The era of Three Strikes had begun, and lawmakers in Washington were in a bipartisan race to prove they were tough on crime. U.S. Sen. Kay Bailey Hutchison, a Texas Republican, introduced an amendment that would ultimately ban prisoners from receiving Pell grants. Her argument then: "Because prisoners have zero income, they have been able to step to the front of the line and push law-abiding citizens out of the way," she said on the Senate floor (though Pell grants go to any and all who apply and meet the criteria). Letting prisoners use federal dollars to pay for college, Hutchison insisted, just isn't fair. "It is not fair to taxpayers. It is not fair to law-abiding citizens. It is not fair to the victims of crime." Two decades later, Hutchison wants to be clear: She's not opposed to prison education. She just doesn't think federal Pell grants should pay for it. "I think it should be a state priority and a state initiative," she says. Tyrone Werts says he watched lawmakers debate the crime bill on TV from his prison cell. Werts had been convicted of second-degree murder for his role in a deadly robbery. At the age of 23, he arrived at Graterford Prison in Pennsylvania. "My reading scores was like second grade. My math skills was second, third grade," he says. Behind bars, Werts studied. He earned his GED, then his bachelor's through a prison education program with Villanova University. It was paid for with Pell grants. "Graterford, when we had Pell grants, was actually like a college or university," he says. "The arts flourished. Guys were having study groups. They were at the table, writing papers." But Werts says that stopped when the money dried up. After nearly 37 years in prison, Werts' sentence was commuted. Now, he works for Temple University's Inside-Out Prison Exchange Program and helps released prisoners re-enter society. "I see a marked difference between those guys who went to college in prison and those guys who didn't go to school," he says. "They think totally different." A 2013 study by the RAND Corp. found that education behind bars greatly reduces the likelihood of a former prisoner committing another crime. But federal law still prohibits Pell grants for prisoners. Only Congress can roll back the law. That said, the Education Department does have one option: It can waive certain rules for research purposes and, thus, extend Pell grants to a small number of prisoners. Think of it as an exception to the rule — not rewriting the rule itself.